We visited my grandparents in Florida numerous times over the years. Essie and Louis first rented in Century Village, Deerfield for a few years until they decided to buy in Century Village, Boca Raton around 1980. It is amazing that we didn’t start a war with 7 of us staying for over a week in a 2 bedroom condo. Each street in Century Village was made up of 3 to 5 buildings with a shared pool in the middle. For the first several years that we stayed there, the pool was not heated. I recall that on the cooler days we went to one of the other streets that had a heated pool. In order to give us something else to do, Essie borrowed an adult tricycle from her sister-in-law, my great-aunt Phyllis Fox. I recall driving this thing around. I was about 6 or 7 the first time I used it and I’ll tell you that I wasn’t the right size for it, not even close! It appears that I rode the bike while Alicia sat on the seat and Darcie had a nice ride in the basket. 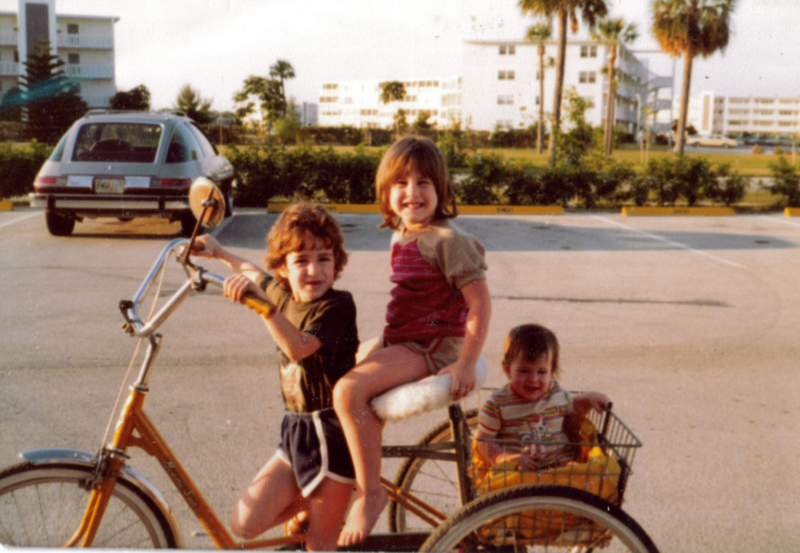 Back in 1993 after Darcie’s bat mitzvah, my grandmothers were having a lively discussion about various things including this biking adventure in Florida. It seems that Essie thought Alicia had an easy ride but Alicia seemed to recall that she straddled the bar. If the picture above is any indication, I seem to be the one on the bar!